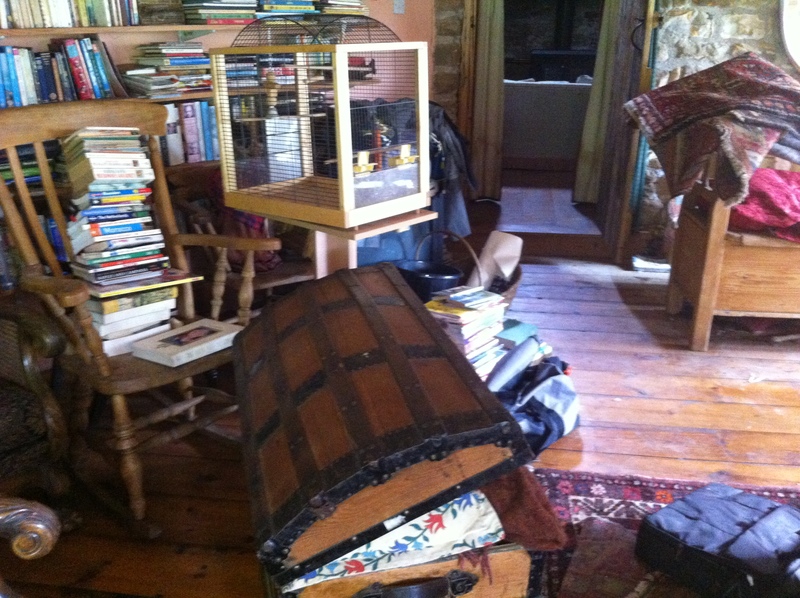 There has been so much to gather and harvest and bring in to the house that I have neglected taking stuff out of it. Every single guide to decluttering will tell you that it is vital that you get the stuff out of the house AS SOON AS POSSIBLE. Otherwise there is a risk that people will start to wander up to the pile and retrieve first one item, and then another. Then, what was once a towering tribute to thrift and minimalism becomes a molehill. While that is a very real concern, it is not one I have to worry about. On the other hand I have a big problem with out of sight out of mind. The flood that prompted this journey began in the Gin Gan (go on google it – you need to learn at least one useless fact a day). This is right at the end of the house just off The Barn. Consequently this is where all the stuff that needs to go has been put. So far so good. I have done four trips to various charities with items to go. This has made only a small dent in the pile. Then we went away on holiday, and on our return I have been harvesting and gathering. The result? I have shut the Gin Gan door. The Gin Gan is a big room (if you have googled it you will know why). It is full. I can look at my increasingly minimalist and ordered house and forget the chaos behind the Gin Gan door. Until yesterday. Singer Two brought down five bin bags of clothes and toys to go to charity. I couldn’t be bothered to clamber round the boxes by the door so I lobbed them over the top. One got stuck and now the door won’t shut. Well it would if I went inside the Gin Gan and got on with packing up and dispatching all our unwanted stuff. Making jellies, and lotions is great fun and I love that we are filling our larder and medicine cabinet with wild food. But there comes a time when the fun has to stop and some work needs to be done. UGH! I am not looking forward to it. But I have a great playlist on my phone, endless cups of tea and industrial quantities of boxes and bags. Packing up time. 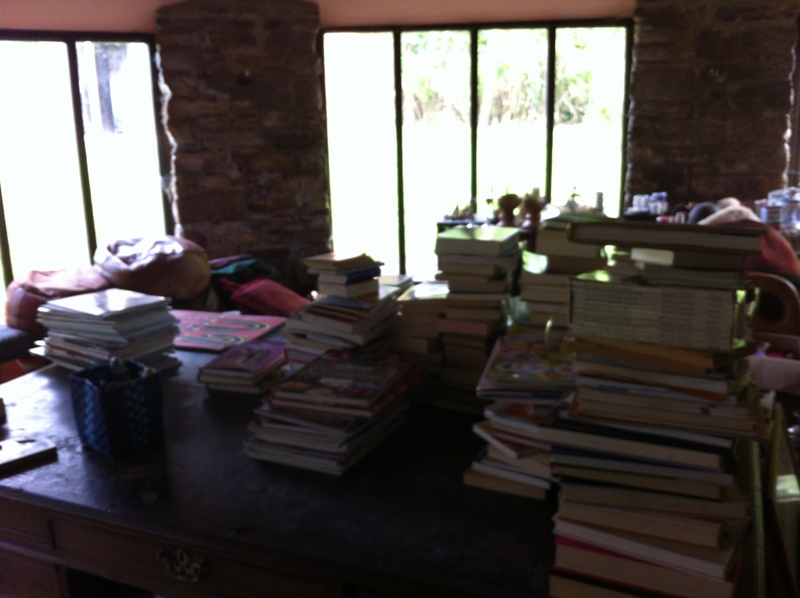 A couple of people asked how I decided which books to keep and which to give away. 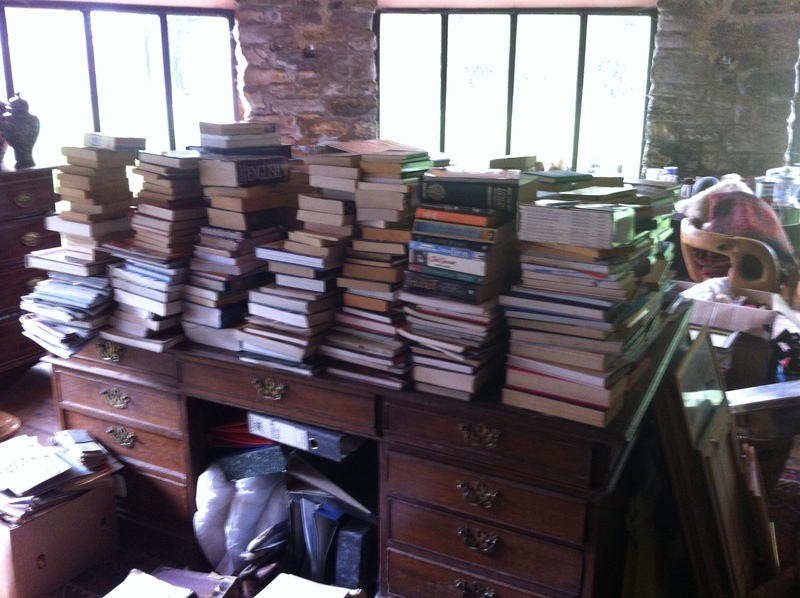 Faced with a wall (or several walls…) of books that you have carefully cultivated over decades is daunting. You have invested a lot of money and emotion in them. They have been old friends. You have carted them from house to house, packed them up in boxes, unpacked them again. Arranged them by size/colour/subject/Dewey Decimal Classification (well maybe that’s just me). You may even have read them, maybe even twice. All of them? No. Recently? No. Go up to your bookshelf/bookshelves/book piles/library (delete as necessary) Go to a random shelf and without pausing pick out ten books you have either just acquired and haven’t had time to read yet but know you will within the next two months or have already read but are so fantastic that you know you will have to read again within the next six months. No cheating, no going to the pile of books that just arrived from Amazon, no wandering around cherry picking. One shelf at random. I rest my case again. The biography of the Duchess of Devonshire may well have been fascinating but are you a historian? Are you going to go back and check facts? Are you a Mitford aficionado and will reread it over and over? Or are you just keeping it because it looks good on the shelf? My first degree was in philosophy. I had an admirable collection of philosophy books from original texts to commentaries and commentaries on commentaries. Today I am a stay at home mum. I do not have an illustrious career or a glamorous high-powered job. I like that. I love doing what I do and if you flick through my gratitude journal you would see I offer up my gratitude for that on a regular basis. However, there have been times when I have been made to feel small and insignificant because I don’t go out to work. At those times it is nice to flick through those philosophy books and remind myself I once read them all and even understood them. Codswallop. I don’t need a pile of dusty books to boost my self-esteem and furthermore I am never going to read them again. Somebody else with a pile of student debt would probably be grateful for them. Some books will have been presents or belonged to relatives. You can’t get rid of them because you would feel guilty. How about feeling guilty that you are hoarding all those precious books which you are never going to read again. Think of the Tate, The National Portrait Gallery, The British Museum. Imagine your indignation if they were closed overnight and only a very select handful of people were ever allowed to visit them and see the artwork and artifacts they hold. But even worse, those people never bothered to go. That’s you and your never to be read again books. By all means keep some for sentimental value. I certainly did. Some of the hardest books to give away were books from my childhood. Though oddly enough as I child and a voracious reader I regularly did deals with the chap who sold secondhand books from a dingy shop on the corner of Hillgate Place and Uxbridge Street. I took him 100 or so paperbacks in part exchange for another selection, which in turn would be returned to him for another and so on. The shop has long gone and last I saw it was a trendy deli. A shame, Notting Hill Gate has plenty of trendy delis, it needs good second-hand bookshops where children can learn to explore and learn the art of part exchange. I’ve preached to you long enough. But please, look at those bookshelves again, take off the rose-coloured spectacles and really look at them. Somebody else could love them, could really use them. Somebody else might read them rather than just dust them. There should be photographs for this post. Photographs of my car stuffed to the gunnels with books. Photographs of the shelves of books at Borderline waiting to be taken to new homes. Photos of the boxes and boxes of books Amina and I packed up out of my car. But I am afraid there are none. Because I forgot. Sorry. I can show you a photo of what is left. Despite filling the back of my Grand Scenic with books there are still more to go. Which is perfectly fine as that means I get to go back to Borderline and maybe this time I will have a shortbread. Better still I can take some with me. This morning I had a meeting in Bensham with the lovely Meg Gilley to talk about spiritual direction, prayer, retreats and what do I think God looks like. It seemed the perfect opportunity to pop down the road with part one of my donation to Borderline. I am so glad I did. As we packed up the books from the back of my car into box after box, I occasionally came across one with which I wasn’t sure I wanted to part. But after talking to Amina and having the grand tour I had no regrets. My books would be going to good homes and would be read and loved, not left to gather dust. The memories are in my heart they don’t need to be on a shelf. Borderline is essentially a free bookshop. 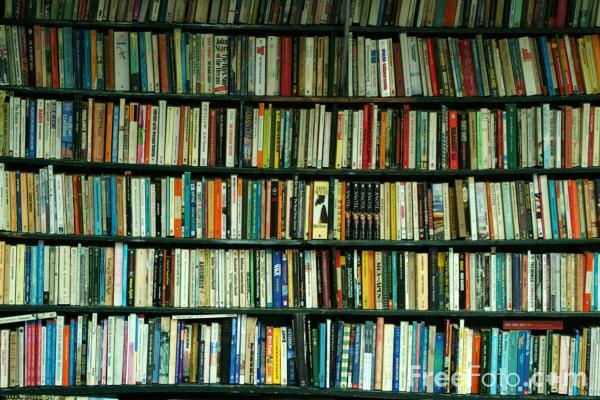 They collect books that are about to be thrown out by publishers, book shops, charity shops and ordinary mortals. The books are sorted and stamped with their name and slogan and then redistributed – free of charge – amongst organisations that help refugees and asylum applicants, homeless people, women and children in shelters and others who have no funds for books. Personally I can’t think of a better home for my books. This all has to go. Some of it already has and much of it is already earmarked but that still leaves a lot of stuff. Do we sell or donate? This is a hypothetical question because we have already decided but with this much to dispose of it was a substantial dilemma. My gut (whose advice I follow quite strictly) feeling is to give. There are two reasons for this, one practical and one emotional. Practically, it is a pain to have to list hundreds of little things on Ebay (or whatever your preferred sale venue) for potentially very little return. Experience has suggested that fishing tackle, furniture, high-end clothes sell well and are worth the effort. The rest no. There is far too much there to go to one car boot sale, we would have to go every weekend for a month and still no guarantee of sale. Life is too short to spend it standing behind a pile of junk in the hope that it might be somebody else’s treasure. Final option was the UK equivalent of a US yard sale. This might have been a viable option if we had any chance of passing trade, but the pheasants and squirrels have shown little interest in our books and the sheep show little interest full stop. Emotionally, I feel that I have more than I need, I have a wonderful home and family I want for nothing. There are people and organisations for whom our duvets and towels would be a lifesaver. To sell them for pennies which I do not need seems wrong. Furniture sold. Having thought this would be very hard it turned out to be remarkably easy. Ask and you shall be given. I just mentioned to a few people that we had some furniture for sale and buyers just came out of the woodwork. Everything usable to St Cuthbert’s Hospice. The remainder to the recycling centre and tip. The balance seems right. I am enjoying seeing everything go, not just because it is wonderful to feel the space they have left behind but also because of the knowledge that instead of rotting away in a cupboard or a shelf unwanted and unused they are going out into the world to be used and loved by people who will genuinely appreciate them. Win Win.